Impingement and rotator cuff tears can be treated non-operatively or with surgery. Treatment for impingement usually begins with a non-operative treatment plan. alone. These results are lower in older patients and in those with large bone spurs. Non-operative treatment is similar for both impingement and rotator cuff tears. A vast majority of patients improve with this primary treatment alone. 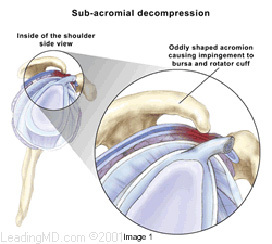 Subacromialdecompressionexpands the space between the acromion and rotator cuff tendons. This can be done either arthroscopically or with open incisions, depending on the preference of the surgeon. During an arthroscopy, a tiny fiberoptic instrument is inserted into the joint. In many cases, the doctor can assess and repair the damage through this scope without making large incisions. Scar tissue or bone spurs can successfully be removed with either technique. If a rotator cuff tear is found at the time of surgery, it can also be repaired if necessary.